The Harlem Globetrotters have a long tradition of getting young kids excited about playing basketball and staying active in life. In addition to all of the activity is the message about the importance of having a good time. Though it is understandable that children who focus on sports will face challenges and pressure later in life, the primary message here is that sports should always be fun first. Globie, the team’s lovable mascot, along with other Trotter team members kicked off a break-dancing exposition full of radical jumps and wild spin moves at the start of this event. This was a perfect start for a group that takes pride in classifying itself more with entertainment than sports, with choreographed basketball, skilled dancing and unpredictable mascot antics. The Globetrotters and their opponents, The International Elites, started with some brief warm-ups. The Trotters took center court for their individual introductions with moments of ball-spinning and trickery of every conceivable fashion. This was set to the team’s classic signature song, “Sweet Georgia Brown” with its catchy, whistled melody. 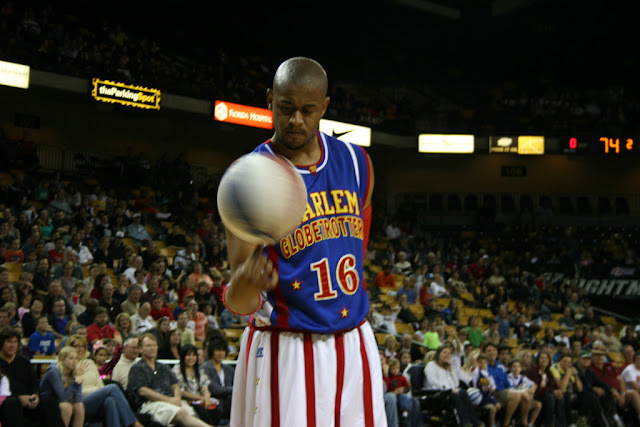 “It’s great for the kids to come out with their family for a few hours and just have fun,” said Globetrotter Nathaniel “Big Easy” Lofton. Lofton acted as the voice of the team by wearing a microphone during the game, explaining why the referees need to lighten up and appealing to the audiance in various ways. Fans of exciting slam dunks, flamboyant behavior and deep shots on the basket were treated to that and much more. Fast-paced passing between ‘Trotters were often followed by high-flying dunks at every angle. Another unique addition were areas deep in the court that were worth four points when activated. This led to a score that quickly spread from one side to the other. “All three of my boys love basketball, and when I saw they were coming to town I had to bring them out,” said Mike Brown. Brown recounted how he loved the Globetrotters when he was a child. He said he was thrilled to now bring his family out to enjoy the experience. Fan interaction was a large portion of the entire event. Young fans were allowed onto the court to shoot free throws for team jerseys, as contests and comic routines were added to the diverse mix. “I wasn’t sure what to expect beforehand, but I absolutely loved the fan interaction with the show,” said audience member Ashley Miller. Miller and her family took part in a giant dance-off on the court before the game was even over. 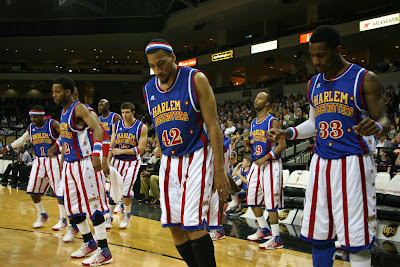 The Globetrotters stayed true to their near perfect record with a sizable win over their opponents. 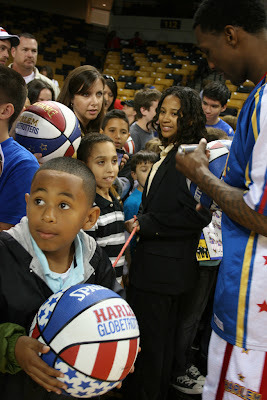 The final tally thrilled the scores of young fans that rushed to the ground floor of the UCF Arena to meet with and get autographs from their favorite Globetrotter players. 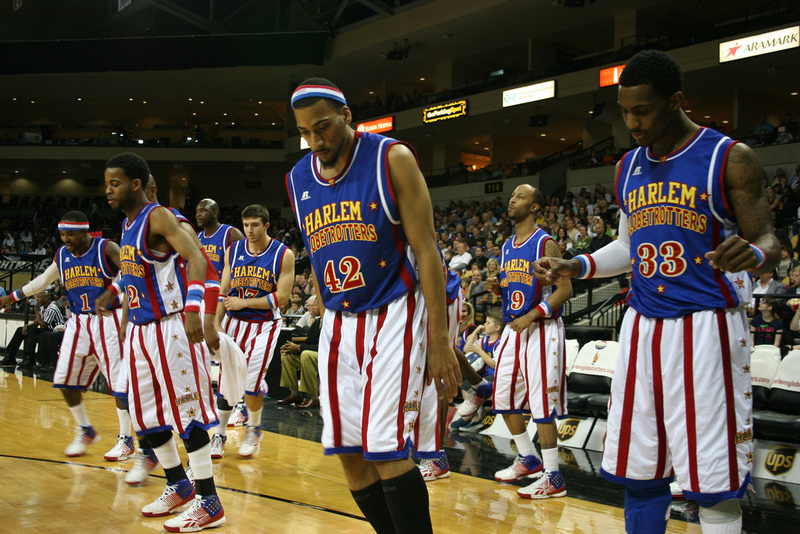 The Trotters often clown around throughout the game to keep fans on their feet. free autographs on Trotters memorabilia.